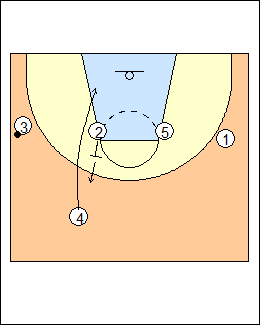 See Offence - DeMatha flex (including denial options). 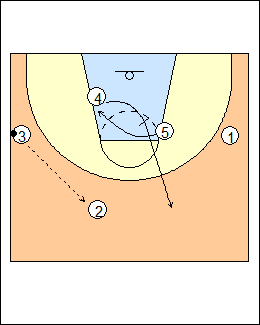 Against a lot of defensive pressure they move up away from the basket, it takes away some of the passing angles but gives a lot of room for backdoor and other cuts, run the offence the same way as motion (flex). 2 and 3 are pretty much in their same areas, within one step of the foul-line extended, but 5 comes up just below the foul line, around the elbow area. 4 does not have to worry about engaging his defender at the 3-point line. 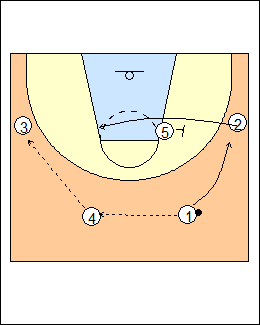 If they can make the pass to 4, the other team is at their mercy, 3 has backdoor opportunities as 2 is cutting off 5. 2 sets an upscreen for 4 then steps out, 4 has a lot of room to cut down to the block, and X5 can't help on the cut. 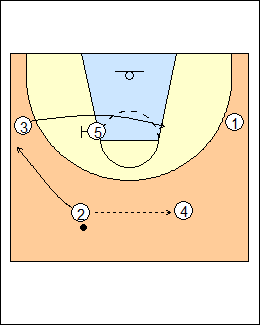 4 goes to get 5 on a diagonal, then pops out. As soon as 5 doesn't get it he gets right back to the elbow. 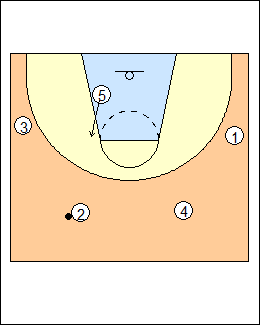 Continuity - flex screen when the ball changes sides of the floor.